Known popularly as Arunachala Swami and referred as Bhagawan by his ardent devotees, Ramana Maharshi can be rightfully regarded as the spiritual southern twin of Sri Ramakrishna Paramahansa, but with a message of his own that is rooted in the age old Hindu traditions of jnana marg (the path of knowledge) in contrast to the bhaktimarg (devotional approach) of the latter. He was born on December 30, 1879 at Tiruchuli, a small village, about thirty miles from Madurai, in Tamilnadu. As a childe he was unlike many other saints and was said to be rather dull and sleepy, without any signs of his extraordinary powers or the great events of his life that were yet to come. In 1896, at the age of 17, he had undergone a peculiar experience at the end of which he overcame his attachment with his physical self and realized the true nature of his hidden self. 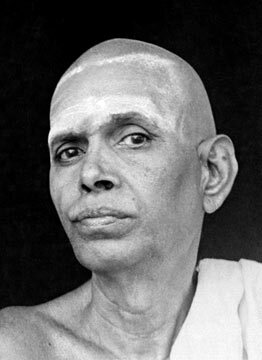 Shortly thereafter he left his home and went to Tiruvannamalai, where he spent the rest of his life providing inspiration and guidance to his followers. During his life time many foreigners visited him including such famous personalities as W. Somerset Maugham and the British author Paul Brunton. An ashram was built for him on a hill called Arunachala at Tiruvannamalai, which became popular as Ramanashram, which is now famous pilgrim center, attracting a huge number of visitors each year. His philosophy was simple, that suggested intense and persistent self enquiry to find the true nature of one self. Sri Ramana Maharshi passed away in 1950. Ramana-maharshi.org - A website dedicated to Shri Raman Maharshi. Sentient.org - A good website containing information about Ramana Maharshi.